1. What is Puluong Retreat? – Puluong Retreat is an eco-lodge, an ideal choice for those who love nature, want to escape from modern life, humming to search for a place to relax and really peaceful harmony with earth and nature. There is no air conditioning, TV, refrigerator, MODERN ENTERTAINMENT SERVICES – The eco-lodge is is a place separated from the noisy, bustling, modern World. However, you still have WIFI so you can still connect with outside World by capturing and sharing scenic photos with your friends while staying here. – You will be visiting numerous waterfalls, caves rich in this place without having to go to Ninh Binh, Cao Bang. – You will discover a land of very few tourists, you will find a secret haven for yourselves. 2. Where is Pu Luong? – Puluong Retreat adjacent highway 15C, under the Don, Thanh Lam commune, Ba Thuoc district, Thanh Hoa province. 3. How to get to Retreat Pu Luong Retreat? 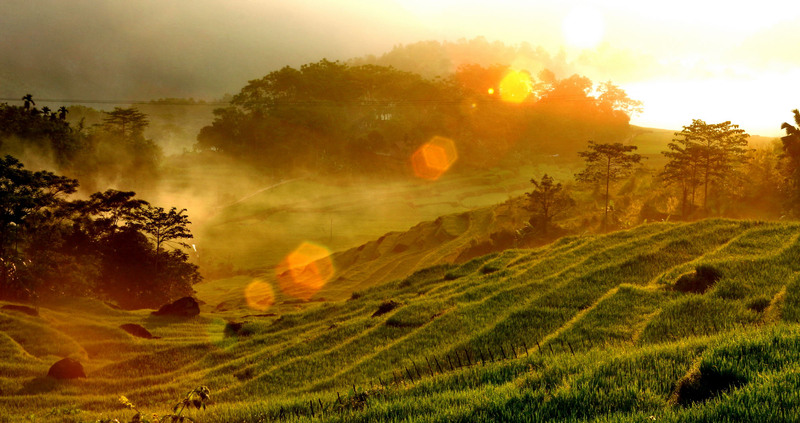 – Currently it is easy to reach Puluong Retreat. All are asphalt, flat, easy to find and easy to travel by car of less than 35 seats. – Puluong Retreat currently offers no shuttle service but there might be service in the next two months from Now (July 2016). 4. Accommodation at Puluong Retreat? – The stilt-house can accommodate up to 19 people with single bed, double bed. – There are 8 Deluxe Bungalow, 3 of them can add extra bed. – Suite Bungalow is a Double room which is the most beautiful thanks to panoramic view and outside shower. 5. Amenities of Puluong Retreat? – Meals are served in the Set Menu, is a combination of local ingredients and exquisite cuisine, professional tourism standards. – All meals must be reserved at least 24 hours prior to arrival because it should take time to purchase ingredients and prepare. 7. Activities organized by Pu Luong Retreat? Puluong Retreat can organize a lot of activities for guests of 1-5 days without being repetitive. The Western Highland used to be divided into 3 provinces: Lam Dong, Dak Lak, and Gia lai-Kon Tum, but now it has 5 provinces: Lam Dong, Dak Lak, Dak Nong, Gia Lai, Kon Tum. Those people lived under a matriarchy; it means their child will bear their mother’s surname. Women are those have the right to make a decision in most important events in family and also are the breadwinner of their family. As a result, women will choose and then decide who will be their husband. If you have the chance to visit an E de family in Dak Lak, you will have more insights into this matriarchy. They have to do all of the hard work so their hands and feet are really rough and big. In the other side, men seem to run errands so that their hands look elegant. The families that are blood-relations will decide whether they will live together in the same house or not depending on their custom. Their Rong houses are next to each other, there is one more house if there is a small family appearing in a big family. That house is called long house. The characteristic of the minority’s houses in the Western Highland all have the only room. The floor is made of wood and has the staircase. Their house tends to have 2 staircases, one for men and the other for women. All of the minority communities in the Western Highland have a Rong house in their village. ‘Rong’ House is the communal house used for the whole community. There is also a bigger and taller kind of Rong House than other Rong Houses in the village. Nowadays it is really hard to find an original ‘Rong’ house across the Western Highland area because almost of them have been destroyed. Today Rong House is just a kind of Rong House model. 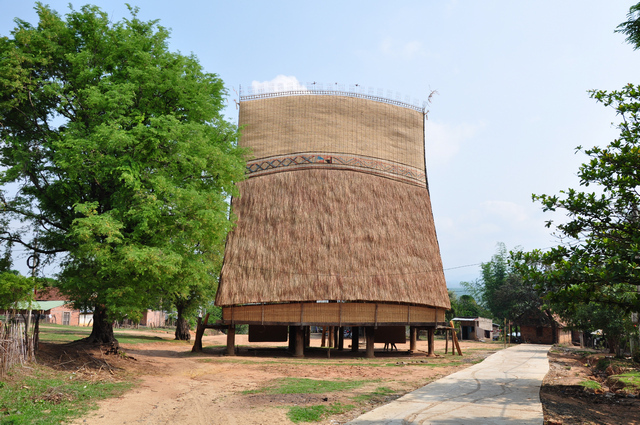 The materials used for Rong House construction is from bamboo, woods in forests, alang grass. In the past, it often takes 2 to 3 years of preparation to build a build a Rong House. They need to come into the forest to collect some kinds of wood, chop them off and bring them home to make house’s pillar. Alang grass used to make house roof needs to be dried before using. Most Rong Houses have the shape of the hammer blade. But the Rong House of Ba Na people has the low floor and roof that is called the short Rong House in order to distinguish with other Rong House of Ja Rai people. Ja Rai’s Rong Houses are much taller. Their height can soar up to the sky (around 20m). If you have ever read the work called “the nation stands up” of Nguyen Ngoc writer, you can understand more about Ja Rai’s Rong House. If you come to the Western Highland these days, the Rong House you can find is made of the cermet and their roof is made of tin. One amazing thing is that most minority people live under a matriarchy yet the village head is men. Each village has 3 or 4 village heads. For example, the head of Rong House is supposed to focus on overseeing and maintaining the Rong House. Other village heads responsible for the water in village concentrate on overseeing and take the water into the village. The village in charge of culture and economics will make a decision on food, particularly beef, and entertainment during the festival. The village in charge of the economy will determine what plants village people will choose to grow in a certain season and so on. The Rong House is where living activities of the whole village occurs. If there are any serious things happening, village people will have a discussion together at the Rong House. As a result, this house is considered the divine place of the Western Highland villages. One amazing thing is that women are not allowed to set foot on the Rong House. Ba Na people these days still remain that custom. A few Ja Rai people’s villages have been destroyed. So women are allowed to come to the Rong House that village uses the Rong House as a church. When it comes to women who are not allowed to come to the Rong House, when I come to the Western Highland for the first time, I follow some of my friends to Ba Na village. A few King women teachers that come with me don’t know this custom. Because they saw the Rong House for the first time, they are too excited to run straight away along the staircase. After setting their feet on the floor, they were arrested by village people. They did it because they suppose that women who come to the Rong House will touch the village ghost. Eventually, the authority here must involve in this in order to settle the problem down. The Rong House of the Western Highland people is where village people have a meet and single young men can come to sleep. Any single village men have the age of 15 and up have to come to the Rong House for sleeping. When mentioning the Western Highland culture, it is necessary to mention the Rong House and H’mo Roong Rau festival. This is a really important festival of village people here. When it comes to Vietnamese cuisine, it will be a big pity if you don’t have the chance to try bun cha that is one of the most top street foods in this country. Besides, there are some other street foods you should try as visiting this nation. Buncha or rice vermicelli is the food eaten along with vermicelli, grilled chopped pork and sour, spicy or well-mixed fish sauce. This food which originates from the North of Vietnam is a really tasty dish in Hanoi capital. So this food could be regarded as a local specialty of Ha Noi cuisine. Rice vermicelli has some features similar to the food called vermicelli eating along with grilled meat in the middle and South of Vietnam, but this food is different by its fish sauce that is made a bit less salty than the rice vermicelli. 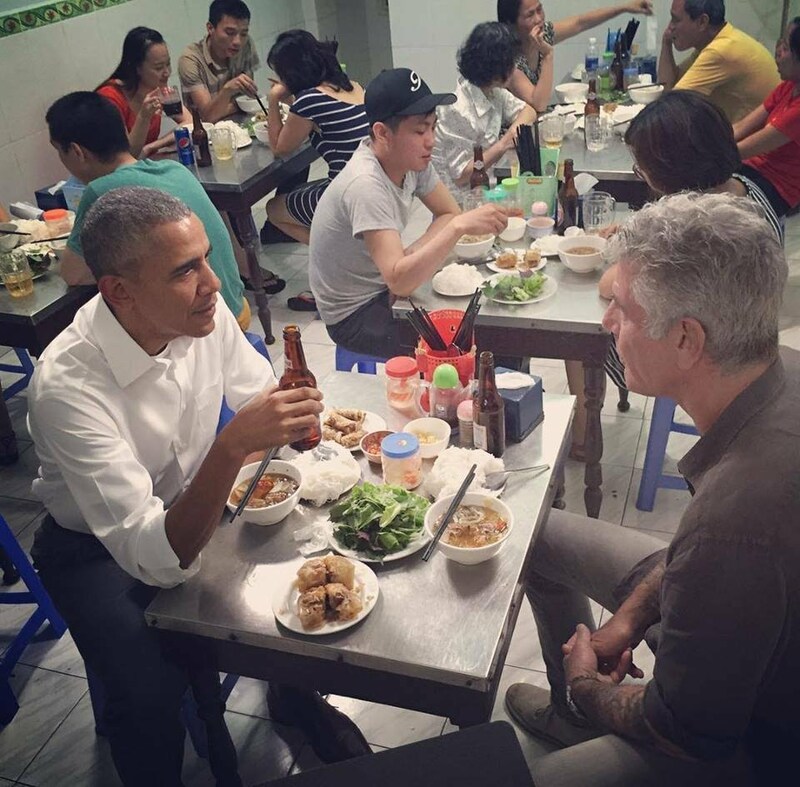 On the arrival of President Obama at Vietnam, he tried this food at the family restaurant and ordered two portions of rice vermicelli along with seafood meat roll and 2 bottles of beer. He and his well-known chef ate all of that delicious food and made a compliment to the restaurant owner and bought 4 different portions to go too. The owner said she had prepared about 50 portions that night but not enough because of a large number of customers. One portion of rice vermicelli here costs 40,000 VND per portion and remains the same for a long time without any intent to the increased price. She said she would soon open up another branch in Lang Ha and the quality of food would be absolutely the same as current. The family restaurant of the Ms. Tuyet locates at Hang Than slope that is quite easy to find. The restaurant is quite small, but full of costumes all the time. The food quality here is always excellent and has not changed over time then this restaurant is really well-known to the local here. They can’t help enjoying it. Apart from including vermicelli, grilled chopped pork and raw vegetable like rice vermicelli in another restaurant, the rice vermicelli here is made in a way that suits most people taste. The meet is lightly baked so it is really aromatic. Meat is not too dry and bitter. The grilled pork is comprised of 2 dishes that are minced grilled pork and piece of grill pork. Minced grilled meat of the restaurant is wrapped with really fragrant leaves called Xuong Song so it feels not too fatty. This dish at this restaurant is also preferred because of the nice and clean presentation of the food. Costumes will be served with a bowl of rice vermicelli with full and neatly arranged pieces of meat as well as raw vegetables placed on a stainless steel tray that looks especially clean and neat. In spite of the food quality, rice vermicelli here is very affordable compared to other restaurants in the town. Just with 35.000 VND you will have a quite heavy meal. If you have the chance to go across Nguyen Bieu Street at noon, you will be attracted by the aroma of this small noodle restaurant, seeing the scene of a large number of customers. Referring to Nguyen Bieu Street, the thing coming up to people mind right away is the specialty of this restaurant that is there is not fish sauce in the sauce. Instead, the sauce is made with just salt and some other spices. In spite of that, the dish in this restaurant still attracts lots of customers. Unlike other restaurants elsewhere, Hang Khoai is the only restaurant that opens in the early morning. The reason why this restaurant opens in such a “toxic” time is that the main customers are lots of people trafficking at wholesale fruit market of Long Bien at this period of time. So the restaurant is available until 2 pm in order to serve lunch to its customers. Cha is made from the minced lean meat of pork shoulder and then turn it into meatball. Then these meatball is mixed with salt, pepper, fish sauce above 35 degrees as well as protein, sugar, dried onion that is finely chopped, water vegetable oil or grease. Depending on the freshness of the meat, after mixing these spices, if the meat seems a bit dry, then add a little oil so that the meat easily turns into balls. If you are a bit picky, you could choose to horizontally pack a piece of meat using banana leaves at a time, the meat will be more fragrant. If the French owns this famous delicious crepe made out of wheat, dairy products, and egg; Vietnamese and particularly local people in Ha Noi Capital will be proud of the steamed crepe made of water and rice flour. Savory meals, the stuffing inside contain wood-ear, ground pork and seasoning. Many street chefs cook the dish right at their door so find a place at which steams are going up high. This dish is often served with sauce, a mixture of sugar, fish sauce, and lime. You may suppose that you have read about this food name before and you’re right. This is definitely listed as 1 of the most popular one hundred dishes you should try prior dying by lots of cuisine experts. Fish is exquisitely grilled and served with rice noodle, green onions, peanut, shrimp paste and drills. The fish have to be carefully selected so there aren’t too lots of bones as well as fishy smells. This famous food is the best-enjoyed food in Hanoi, where the dish was invented just in the 20th century. Rice noodle soup could be seen almost everywhere in Hanoi, it appears anywhere from the street to restaurant chains. Some kinds are served along with the chicken and others with beef. Every type of the meat entails a variety of the sub-dish by utilizing from beef brisket to beef tenderloin, chicken thigh to the chicken wing. The advice is to find the some places where the local gathers the most so you know exactly where to sit down and order. If Pho could be compatible to the linguine in its shape, this is mostly like spaghetti. This dish is a quite popular but hidden fare in the capital of Vietnam and people could hardly look for it the outside of old quarters and some special restaurants across the capital. Chicken broth is well done so the dish is really beautifully served. So hopefully this info on most popular street food in the country of Vietnam will help you get the most of your trip.